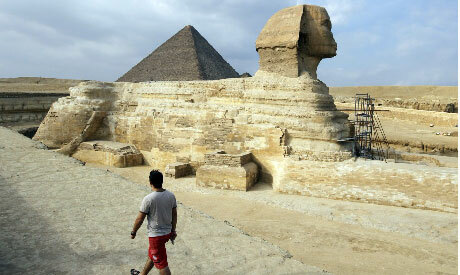 The number of tourists visiting Egypt plunged by a third in 2011, data from the country's state statistics body showed on Sunday. Tourist numbers fell to 10 million last year from 14.7 million in 2010, according to the report from the state-run Central Agency for Public Mobilization and Statistics (CAPMAS). Europeans made up 4.5 million of the 2011 total, a significant fall from 7.1 million the year before. Just over half the combined total of European holidaymakers came from Britain, Germany and Italy, which have, respectively, the top three market shares, figures show. Visitors from Arab countries as a whole also declined to 1.8 million, down from 2.1 million in 2010, mainly caused by a decline in tourists from Saudi Arabia. Other Arab nations, however, partially compensated as Egypt's hospitality industry saw unexpected effects from upheaval across the rest of the region. While the Saudi share of the Arab market dropped to 11 per cent against 18 per cent in 2010, Libyans fleeing unrest in their own country and setting up base in Egypt helped up their share to 29 per cent from 22 per cent the year before. The proportion of Palestinians climbed too, reaching 13 per cent in 2011 next to 9 per cent in 2010. Any non-Egyptian entering the country and spending more than 24 hours there is counted as a tourist, no matter the circumstances behind their arrival. CAPMAS did not provide detailed data for other nationalities. In December, Egypt's tourism minister Mounir Fakhry Abdel Nour said tourism revenues had fallen by 30 per cent over the course of the year.